Heather has always been enamored of many types of movement, from tap, jazz, and modern dance, to tai chi and yoga. 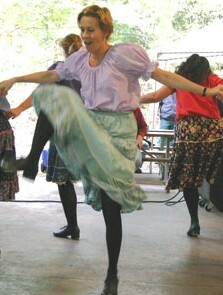 Ever since she took a clogging class from the Apple Chill Cloggers in 2003, her toes just kept a-tapping! She officially joined the team 2004. Heather’s other passion is her work as an acupuncturist and herbalist in Durham, NC.